Ooh. 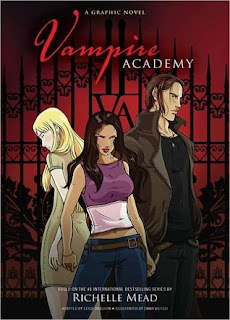 Vampire Academy the graphic novel by Richelle Mead is one I've been excited to read. I don't read many graphic novels, I'll admit, but I've really enjoyed them in the past. This one was no exception. Embarassing confession time: I haven't yet started the Vampire Academy series. I know lots of people love and rave about them, but I've always been a little unsure. I nearly caved last year after all of the excitement and buzz surrounding the publication of Last Sacrifice, but not quite. I have the first three books but I think I've been waiting for something other than a glowing review of the series to push me over into being excited about these books. And the graphic novel really did that for me. At times, I was a little confused by the cast of characters. Sometimes I was confused about some big event that had just occurred because I couldn't quite work out what the facial expressions in the illustrations meant. But aside from that, I was still gripped throughout it all. Despite it not having all of the thoughts and feelings that would normally be in a novel present, I was still able to feel the tension between Rose and Dmitiri and the close relationship between Lissa and Rose. I learned enough about the Moroi/Strigoi/Dhampir to be sufficiently intrigued. It was all very exciting and fast-paced and I was left guessing and surprised. It's a really fun story that I think is quite suited to a graphic novel format. I loved the seeing the events unfold as well as reading it. I thought the illustrations were really beautiful. I thought the graphic novel did a great job of fitting everything in in such a short amount of space and it's really the perfect taster for me. I will definitely go from here to reading the novel and perhaps other reluctant readers will do the same. I have heard a lot about this series, but never read it. The new attention is getting because of this graphic novel and a new book makes me curious. I read the first book a few weeks back because I wanted to read it before the GN was published (I adore Emma Vieceli's art so I knew it would be a must have for me). It's great to see great reviews for the GN, I'm definitely looking forward to it. Kailana - Oh do read it! Since I read the graphic novel I've actually finished three of the Vampire Academy novels, they really are wonderful! Susan - I hope you do, the illustrations are wonderful and I think it sums up the story reall well! And the definitely do pick up the books. I'm reluctant about reading this series too - I'e been afraid that I'll be let down by all the hype! But I think I will now! The graphic novel sounds amazing! I've never read a graphic novel before (I know, I really should have) but this one has had some glowing reviews that it's made me really curious! Cliona - Oh I do recommend the series! But I also thought the graphic novel was a great stepping stone into the series..
Jules - I've only been a recent convert to graphic novels and there are only some I'd be bothered to read, but thisone was quite good!